* Fares and Explore4 offers are based on Promo(s) KA/KC/JA/NX/NP/UU. Featured sale fares are per person based on double occupancy, cruise or Land+Sea Journeys only. Fares are in US dollars. Taxes, Fees & Port Expenses are additional on all fares for all guests and range from $80.00 to $1,090.00 Subject to availability. Offers are per stateroom based on double occupancy, for 1st and 2nd guests sharing a stateroom and excludes 3rd/4th guests, except as provided herein. Offers are available for new bookings only, apply only to the cruise portion of Alaska Land+Sea Journeys, are not combinable with any other discounts and are not transferable or refundable. Offers are applicable on select 2019-2020 sailings. Signature Beverage Package has a daily limit of 15 beverages. Pinnacle Grill dinner: Guests receive one complimentary dinner per person. Free or Reduced fares for 3rd/4th guests are based on sharing a stateroom with 1st and 2nd guests. 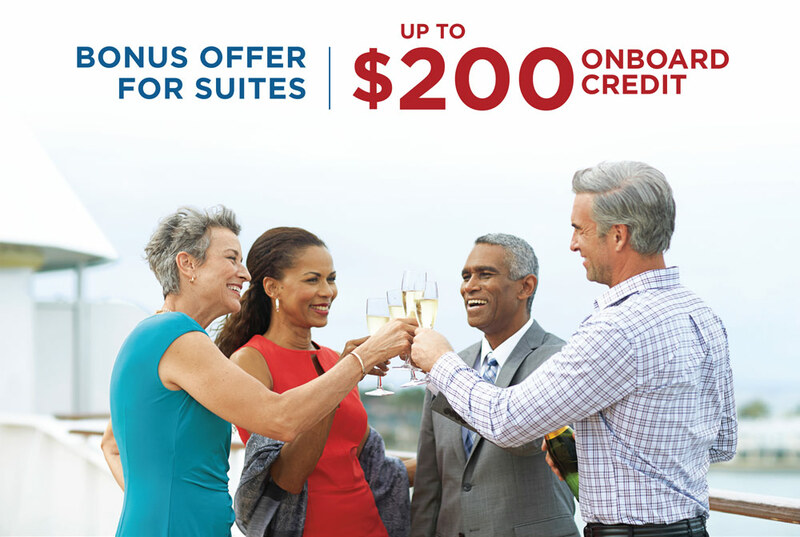 Suite offer: Onboard Spending Money is US$100 per guest (US$200 per suite). 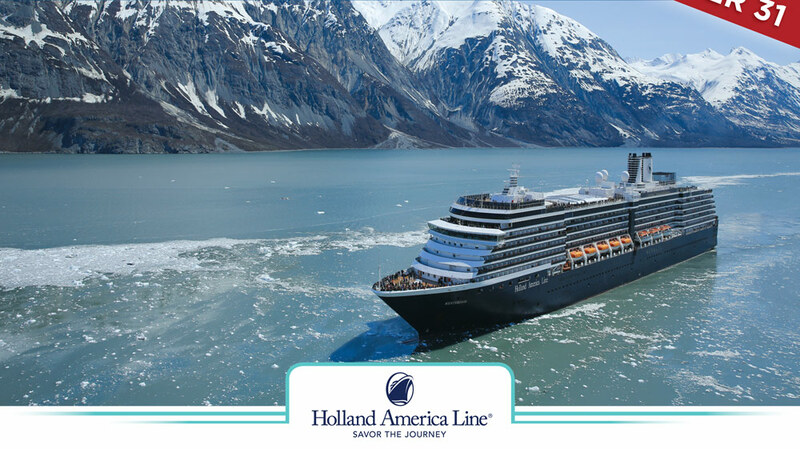 For full offer terms and conditions, please refer to hollandamerica.com/Explore4. Offers are capacity controlled and may be modified or withdrawn without prior notice. Other restrictions may apply. 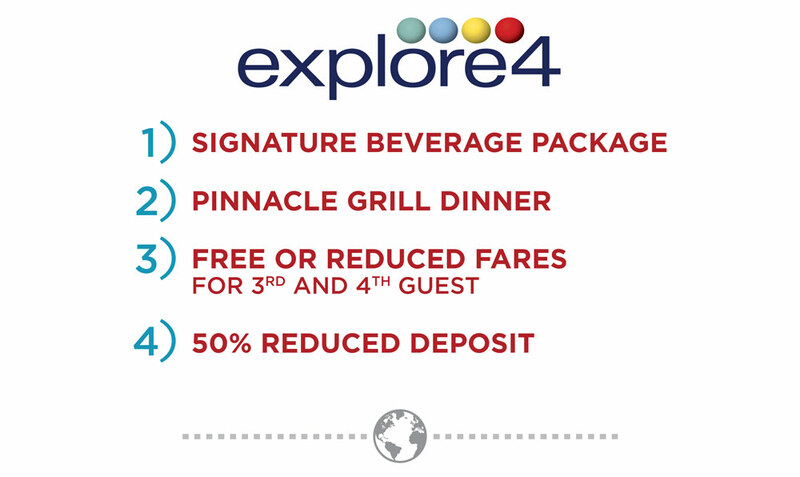 Explore4 offers end 11/19/18. Shipsâ€™ Registry: The Netherlands.